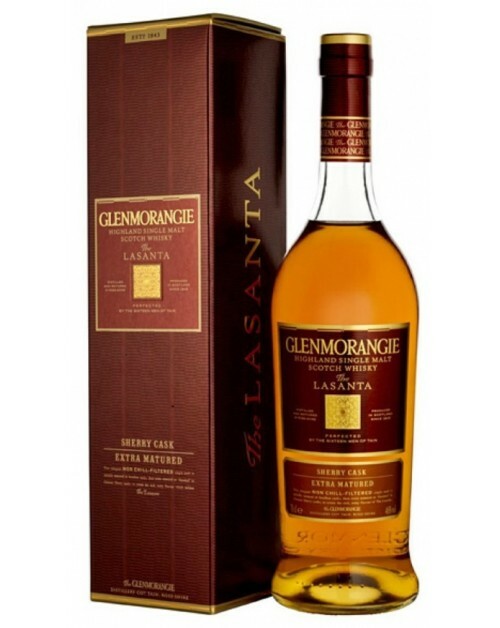 Glenmorangie Lasanta Single Malt Whisky is an elegant and full bodied whisky which has spent ten years maturing in American white oak ex-bourbon casks before being extra-matured for a further two years in Oloroso Sherry casks from Jerez in Spain. Nose: Warm spices mix with smooth chocolate covered raisins, honeycomb and caramel toffee. Palate: Sweet sherry, sultanas, orange segments, walnuts and butterscotch combine with complex warm spices. Finish: Long with spiced orange and chocolate covered hazelnuts; rewarding.